Dashiki Clout, the small indie label of Mustard Plug frontman Dave Kirchgessner, has been around since 1991, but has only previously issued 10 releases since that time. 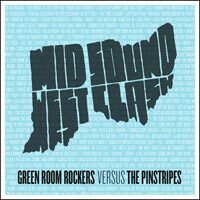 Kirchgessner gets things moving again with Midwest Soundclash, a 10-inch split between Layfayette, Indiana's Green Room Rockers and Cincinnati, Ohio's the Pinstripes, designed to commemorate the 30th anniversary of the Specials / Selector 7-inch. The vinyl features three tracks from each band. Half of just more than 500 records pressed feature translucent vinyl, while the other half are blue. The split also comes with two different options of artwork, both hand-screened and hand-numbered by Pinstripes guitarist Matt Kursmark. One design, the better one, features two towers of speakers with cords winding through them symmetrically on the cover, with microphones facing one another at the bottom, all on the baby blue background. The other forms the states of Indiana and Ohio with the split title, Midwest Soundclash. Both come with a large card with lyrics and album credits. It is quite nice packaging for the vinyl collectors. The music is not bad, either. Both Green Room Rockers and the Pinstripes play a combination of reggae, ska and a touch of American soul music that leans more toward the sound of bands like the Aggrolites and Westbound Train than Mustard Plug. The rhythms are laid-back with heavy bass grooves, but full of energy throughout. Green Room Rockers kick things off with "Revival," a tune about people of the world finding something to make their lives better in reggae music. It starts with a heavy horn line and then a slow skankin' rhythm. There was a granny in her bed, barely livin' almost dead / She didn't want to move at all / she was afraid she'd take a fall / then she turned on her radio / it played a sound she did not know / this sound excited her so / made her strength grow and grow"
"Irony" slows things down a bit to talk about how crazy life can be, highlighted by a soulful trumpet solo. "Stay with Him" closes out the side, and is the grooviest of the bunch, bringing back the prominent organ from the first track, telling a story of being left for someone else. The Pinstripes continue the vibe on their half with "Come on In," "Cool Whip/Hot Sauce" and "Rest My Head." The highlight of the first track is vocalist Mike Sarason, who takes a traditional reggae approach to some of his lyrics and does it well, marking the best track of the effort. The band knows how to build a tune with big horns and some back-and-forth vocal work, as well as a great instrumental outro to the track. "Cool Whip/Hot Sauce" contains only those words, and simply creates a smooth vibe with a few moments of spice in the otherwise instrumental track. "Rest My Head" serves as a decent closer, but doesn't quite have the same punch as the rest of the songs on Midwest Soundclash. Overall, Midwest Soundclash sounds at times a bit too much like its influences for its own good, and fans hoping for variety will find none of the faster ska-punk sound. But for fans of the genres harnessed by these bands, both Green Room Rockers and the Pinstripes have the energy and musicianship to pull it off and keep it exciting. Both bands boast incredibly full sounds, likely in part due to the production work of the Slackers' Dave Hillyard on Green Room Rockers' half, Chris Grannen for the Pinstripes, and the split mastering of Mass Giorgini at Sonic Iguana Studio. Midwest Soundclash should please the ska community looking for something more laid back, and vinyl collectors will appreciate the effort put into the release.